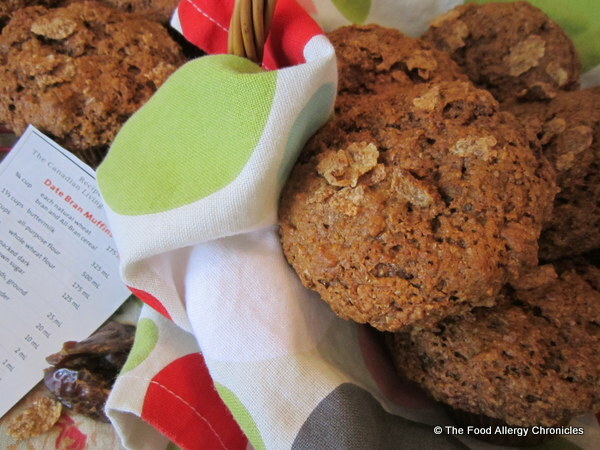 Posted on April 22, 2013 by Susan H.
It’s Allergy Friendly Muffin Monday! I am a ‘bran fan’…Raisin Bran, Bran Flakes, Weetabix…does anyone remember the cereal Pep? Loved it! Topped with something sweet…my favourite was a layer of Demerara sugar…I was ready to start my day. I have always been a ‘muffin fan’…so it was natural for me to transition my love of bran, muffins and allergy friendly baking into one. 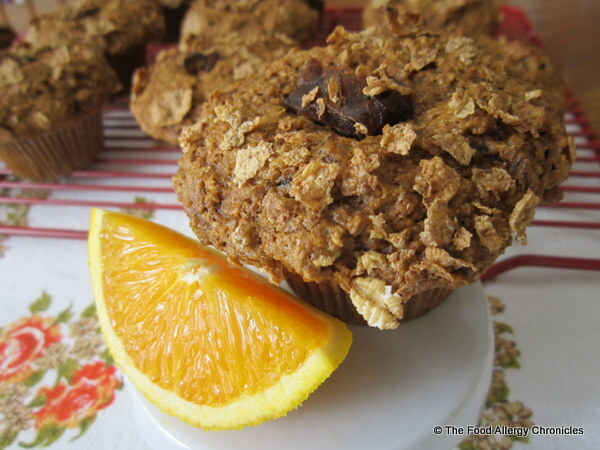 Moist, rich in flavour, with a touch of orange sweetness…these muffins satisfy my bran muffin cravings. I re-discovered this recipe from my clippings file…Canadian Living Magazine’s March 2001 edition. Click here for the original recipe. Just a few adaptions to make this recipe dairy and egg free. 2) Replace 1 egg with 1 tbsp. flaxmeal mixed with 3 tbsp. water and left to rest in the refrigerator over night. 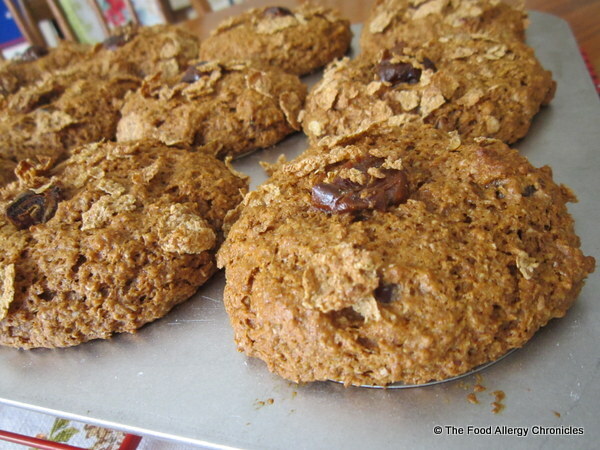 3) For a touch of orange in the recipe…replace the flax egg water with 3 tbsp. of freshly squeezed orange juice and add the zest of one orange to the dry ingredients. 4) To up the fibre…I replaced the 2 cups of all-purpose flour with whole-wheat flour which increased the whole-wheat flour in the recipe to 2 3/4 cups. 5) I placed a bit of date on top of the Dairy, Egg ,Soy and Peanut/Tree Nut Free Orange Date Bran Whole-wheat Muffins before I sprinkled the tops of the muffins with All Bran Flakes before baking. I think the combination of the molasses, dates and bran create a rich, moist flavourful muffin that will change your mind about bran muffins if you’re not already a ‘bran fan’! For sustenance…the lovely ladies enjoyed sampling my Dairy, Egg, Soy and Peanut/Tree Nut Free Date Bran Whole-wheat Muffins. 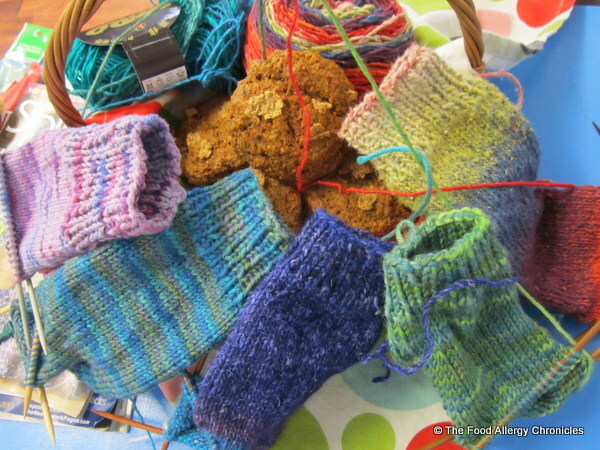 I was surprised to learn…all the lovely ladies at knitting were ‘date bran fans’…not necessarily ‘raisin fans’. One of the lovely ladies at knitting suggested the addition of orange. I couldn’t resist… I had to make a batch the very next morning. Dates + Bran + Orange = Perfectly yummy! P.S. My neighbour, Joanna, also writes a blog., That Thing I Made..today it was a very personal and heartfelt one concerning her friend with a brain tumour. I would have been honoured to join her ‘Team Running For Love’ but unfortunately, I will not be available. My thoughts and prayers are with her and her family during this very scary time. Click here for a link to her story. Update: Carla @ My 1/2 Dozen Daily has generously offered to put names in draw to win one of her beautiful hand-made summer tote bags to anyone that donates a minimum of $10.00 to the Brain Tumour Foundation of Canada. Click here for more details on her blog. This entry was posted in allergies, baking, dairy free, egg free, knitting, muffins, multiple food allergies, peanut/tree nut free, soy free and tagged Canadian Living magazine, Dairy Egg Soy and Peanut/Tree Nut Free Date Bran Whole-wheat Muffins, Natur-a Rice Beverage, Natur-a Soy Beverage by Susan H.. Bookmark the permalink. mmmm!! Those look fabulous! Now i’m craving cookies! lol!